Ain’t that a task! We don’t often take the time to sit down and really figure out why we do what we do – and we should. As I first began to think about who I am as a dancer, a wonderful metaphor came into being – I am the Magician and the High Priestess. These figures come from the Tarot and refer to two different important archetypes. The Magician is the creator of his/her own reality, confident, logical, and stable. The High Priestess embodies the unconscious – intuitive, non-linear, and mystical. As a dancer, I am both the creator and the creative, in the very same moment. 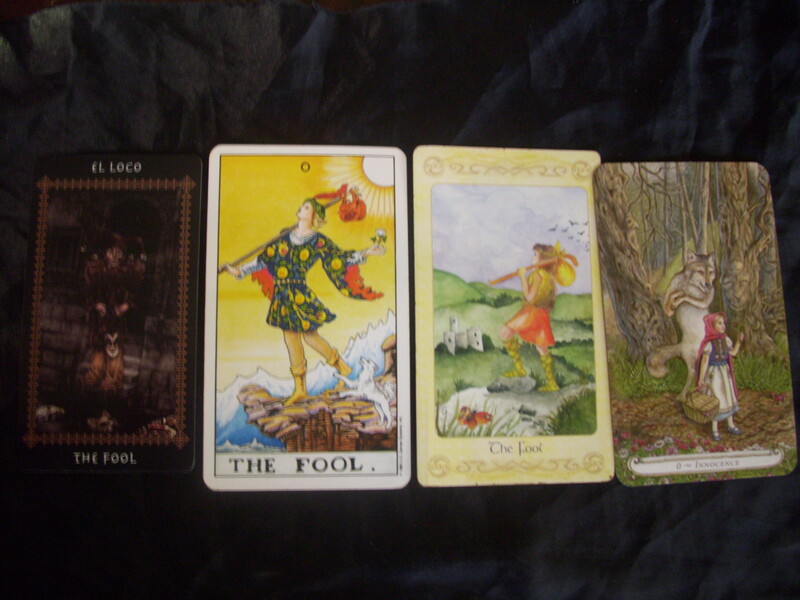 I then realized that 1 – that’s not 300-500 words and 2 – that doesn’t make much sense to the non-Tarot-inclined. But why shouldn’t I use the Tarot to help me flesh out the statement I’m really trying to get at? Why do I dance: 6 of swords – I dance to transform emotions into power – the power to captivate and influence and inspire. In dancing, I allow myself to express things that the logical mind has no words for. Why is dance important: 7 of wands – Dance has always been and should continue to be a powerful venue for creation, expression, and passion. We consciously create a space and community that fosters that exchange – we challenge each other to grow and dare and become more. 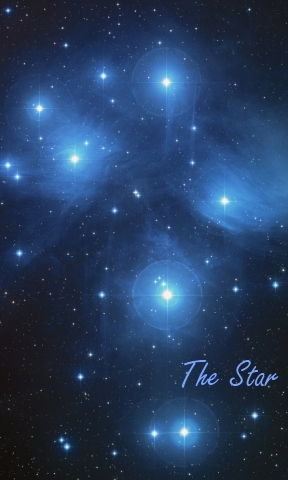 Who am I as a dancer: the Star – As a dancer, I am free to express joy and grief – and anything in between – in a purposeful and fulfilling way. I give myself the freedom to follow my own path and in doing so, unconsciously allow other to do the same. What an insightful read! And this format could be used with just about anything: why do I teach, why do I seek out knowledge, why do I (insert job here)… I think you get the idea. Since I’ve been thinking about movies and Tarot as of late, I thought I’d share a beautiful movie that uses some familiar Tarot archetypes. Unlike the other movies I’ve shared, this isn’t a documentary. You may have heard the name in relation to the death of Heath Ledger, as this was the movie he was filming at the time and is his final role. As you may have guessed from the trailer, the Devil archetype is a major part of the plot. He spends his time weaving webs of bets and debts around Doctor Parnassus. He knows that the man can’t resist a bet, knows that he can’t say no. He finds a way to make that bet, no matter how dangerous, seem tempting and worthwhile. The Devil in the Tarot is much the same. The Devil is all about temptation, desire, wanting, longing. The physical things that distract us from our lives is what the Devil offers us; the bad habits and relationships that hold us back. He makes them look so good to us, like they are the only things that we could want. He tempts us and addicts us; makes us think we need what ever it is he’s pushing. Be it power, escape, wealth, or anything else, it distracts us from our true selves and keeps us bound, constrained. The Devil also reminds us that we choose to “give in” to temptation and that we therefore have the power to turn away from temptation. If we have the will, and we make the choice, we can break the chains that bind us. Perhaps less obvious from the trailer is the role of the Hanged Man (mentioned before here), symbolized by the character Tony. As I’ve mentioned before, the Hanged Man speaks to one’s sacrifice for knowledge and wisdom. I don’t want to spoil the film, but it’s sure to say that “sacrifice” is indeed an important aspect to Tony’s progression through the story. Even if you’re not a Tarot lover – I highly recommend this stunning movie. This is an interview by the Tarot Lady (Theresa Reed) with Angelo Nascios – a voice in the Tarot world who I greatly admire, and have talked about before. The real meat of this interview is the topic of young readers in Tarot, professionally speaking. Of course, I’m fascinated by this, as I am (more or less) a professional reader though I do offer other readings. We have a divination discussion group at my local New Age shop, and often I am the youngest one there – but have been reading longer then some of the others! Do we question the abilities and potential of the Fool? I love to see readers my age, or even younger. Actually, a young woman (maybe 14) signed up for my Rune Workshop – and I was so excited because everyone else was old enough to be my mother/father. They actually didn’t realize – even as I walked back and forth from the “big room” that we hold classes in – that I was the one leading the workshop until I invited them to come in and sit down. I often hear from people after readings that they didn’t expect me to “be so good” because of my age. All too often we forget that in spiritual matters, the age of the body can be a very misleading factor. I’ve been told all my life that I have an “old soul” and perhaps that is a factor in my affinity for divination. Maybe it doesn’t matter at all – I don’t know. Either way, it’s important to keep an open mind and heart in these sorts of matters. Tarot Insight – Congresswoman Gabrielle Giffords shooting. I adore Angelo Nasios and his work with the Tarot. I’ve mentioned him here before, but this is a little different. In this linked post from his blog That’s Totally Tarot, he uses the Tarot to investigate and understand the recent shootings in Arizona. He inspires me to use Tarot (and other divination systems) in new and unconventional ways. I’m always on the look out for new and interesting divination spreads. But today, I thought I’d share some basic, flexible spreads that can be used with just about any card like divination system. The Three Card Spread: Perhaps the most basic spread that exists. This is simple three cards (or tiles) laid out in a row. The most common interpretation is past/present/future, but this isn’t the only way to use this super flexible spread. Pretty much any trio could be used: thesis/antithesis/synthesis, mind/body/spirit, feelings/thoughts/actions, and the list goes on. I like to use this spread when doing a short reading, or in order to get a ‘theme’ for a more in-depth reading when a client doesn’t have one. 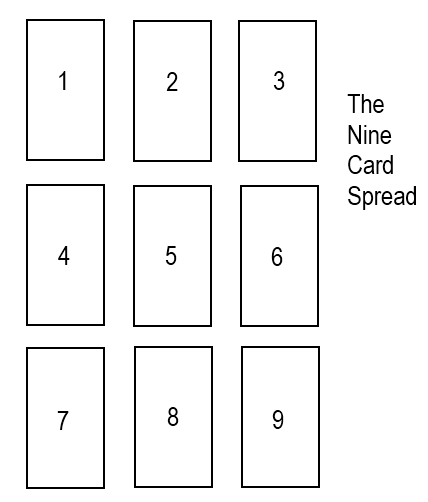 The Nine Care Spread: This is very similar to the three card, but can be much more in-depth from the get-go. The cards are laid out in a 3×3 square shape. They way I learned this spread was: the first row (1-3) represents the future aspect, the second row (4-6) represents the current aspect, and the last row (7-9) represents the past aspect of the situation. On top of that the left column (1,4,7) represents the unconscious attitude towards the situation; the middle column (2,5,8) shows the actions taken or the outside forces in the situation; the right column (3,6,9) represents the conscious attitude (or thoughts) toward the current situation.